Most of us are familiar with the Butterfly Life Cycle; After butterfly eggs hatch, they become caterpillars (larva), and following an eating spree they reach the pupa (chrysalis) stage where many build a silk covering around themselves called a cocoon. They then emerge from the chrysalis as a butterfly. Voila! 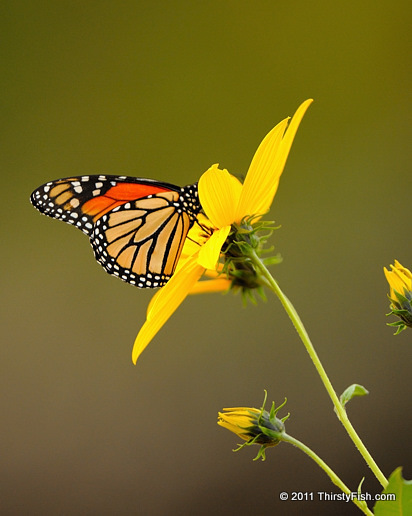 The Monarch are the most easily recognized North American butterflies. They are also foul-tasting and poisonous to many predators and their bright colors are believed to function as a warning sign. The most interesting fact about Monarch butterflies is their lengthy two-way annual migration from Northern United States and Canada to Mexico and back. While the Southward migration is completed by one generation, the Northward migration is accomplished by 3-4 generations. Many organisms have evolved to develop antipredator adaptations. Some organisms signal predators through warning colors, sounds, odors and other perceivable characteristics. This is known as Aposematism. Other organisms have adapted the opposite tactic, Crypsis; They avoid detection by camouflage, nocturnality, subterranean lifestyle, transparency, or mimicry. All these sound like martial tactics don't they? Yet another example of biomimicry.